Inglaterra Hotel is a National Monument that shows the singular elegance of the elected ones: the neoclassical magnificence of its facade in harmony with the strong Mudejar accent of its interior decorations. 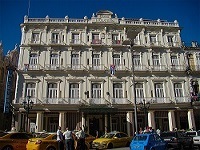 It is the oldest hotel in Cuba, founded in 1875 in front of the Central Park, a few meters away from the Great Theater of Havana, the National Museum of Fine Arts, and the imposing Capitol. The perfect place to start and end a journey to enjoy all the beauties of Old Havana.